“These are bad times, war has eaten the entire plane of worlds, 4 AA, the First World War has provoked between the brains and the humans, with the brains failing to defeat the humans and falling back to their lairs, the humans have also suffered many losses, a great loss of civilization, resources, lives, even sanity has been dumped into the lakes with all the dead bodies of fallen soldiers, the war has ended 4 years afterwards. Is this like that one 300 movie, but 400? Will it feature Dungeon theft in open worlds? And this, my children, is why we are in constant war, and are constantly moving from our homes,” Says an apparently very old man. “But we have enough money to buy weapons, don’t we?” Says one of the older boys. “Son, just because we can, doesn’t mean we could.” Says the old man. “Are we going to live an unstable life forever?” Asks a little girl. On the 21st of June, a child was born, son of a poor junk craftsman and a poor jerky craftswoman. He has been a tiring birth, his mother was left sick after the birth, and they were never sure whether the child was going to live in this world or the next. “What can you do?” Says Mr. Greenwood. Two days later, the child is in his home, happy and playful, and surprisingly healthy, unaware of the situations he has put his family into. Meanwhile, in the greatest castle in the universe, Banestone’s Fortress, a man in a black cloak enters the fortress, surrounded by guards, at first it would seem that they are guarding him, but truly, they are guarding the gangleader FROM him. “Say what you have to say, mister..” Says Banestone, a powerful man, armed in Grymwear armor and holding a huge sword, it looks perfectly crafted by a very talented man. He has a fierce appearance and a sharp look, almost looks like Brainstorm himself, but a more evil clone. “Say what you have!” Repeats Banestone. “I said send the guards off.” Says the cloaked man, getting angry. The man takes off the hoodie of the cloak, revealing a bald head and a huge beard, he flicks his finger, nobody saw what happened because of the speed of it happening, but all the guards were on the floor, bleeding to death, and some hanging on the ceiling, and one living guard held by the head in the man’s hands, before he crushes his skull and sends blood splattering at the gangleader’s face. “I like this guy,” Says Banestone to his knight. “Now that we have enough space, I have an unearthly message...” Says the cloaked man. “Who is this child?” Asks Banestone. The man disappears, sparks drop from around his position, and a small Terrapus starts roaming around from his place. Days later, Mr. Greenwood has decided to travel to Brimwood Land, a new country established by a fair king in a far away land, the trip itself would take weeks, and as the man travelled with his only child, he watched as babies were taken into the town squares and publicly shot, hanged, executed, and some even burned to death... unable to do anything about this, he finally reached the gates out the country, a rough and evil officer was standing, and he stopped the cart carrying the two. “... two monthes.” Says Mr. Greenwood. “No!” Replies Mr. Greenwood, unhesitatingly. Quickly, the officer takes his Mark IV pistol out, and aims at the child! 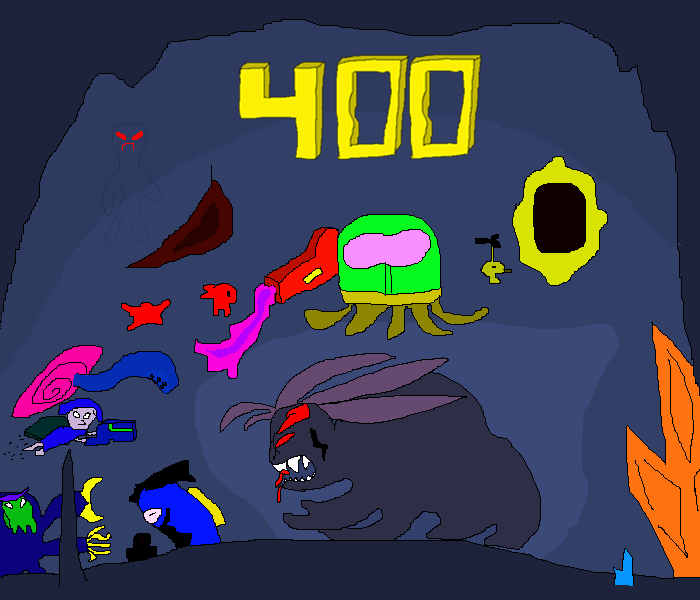 Official “400” theme image, if you PM me, I’d tell you who are the secret characters in the image. Haven’t read anything yet but I feel like I’m gonna enjoy your stories.... maybe you’ll encourage me to continue my own stories that never went into anywhere. Thanks for your early compliment, and yeah, you should totally keep writing! Just as he reaches to pull the trigger, a man emerges from between the soldiers, he takes a gun from a nearby soldier and shoots at the officer, wounding his leg, the officer orders the soldiers to seize the man, but they find the man to be gone! The officer looks in front of him again, but doesn’t find the man nor his child! “What do we do officer?” Asks a soldier. “Do you understand? !” Shouts the officer, holding the soldier from the shoulder. Across the world, in a giant underground cave, a bunch of terrapi are collected, gathering resources and food. One large terrapus, larger than any other, talks with a significantly smaller. “Sage, how did the team you sent fare?” Asks the giant one. “Yeongyul, we don’t have the resources nor the space to farm... nor do we have healthy men!” Replies the Queen. Just this moment, an explosion has been heard in the cave roof, the sandstone on the roof falls, ruthlessly crushing many terrapi to death..
“All soldiers and capable units, prepare your weapons to defend against impeding threat!” Shouts the Queen. All of a sudden, brains start flying into the giant cave, mercilessly killing any terrapi they come across, with flame, with energy, with anything they can put their grips upon first.. hundreds of terrapi are roasted to death, and hundreds more by the minute! The terrapi valiantly attempt to defend, but their outdated weapons could not fend off the brains, and in the end, they died bravely and were thrown into piles of giblets that were transported to the ship. There, stood the Queen, almost completely alone and surrounded by a few remaining men, who wish to die a hundred thousand times in the sake of their mighty queen. Without hesitation, the brains kill the remaining terrapi, and before getting to the Queen, a brain emerges from the crowd, with a mark IV flamethrower in hand. “At last, I have found it!” He says. “Yes, you’re not my meat to eat, the emperor would pay thousands for a royal meal from a royal Terrapus Queen! Neheheheheh!” Laughs the Brain. “You will never take me alive!” Shouts the Queen, as she spins, knocking a few dozen brains and killing a few more brains, but quickly being roasted by the same brain. The brains cheer and party in the cave, dancing over the corpses of the valiant terrapi, and drinking from bottles with wine decorated and made more delicious by their blood... as this happens, Yeongyul, the queen’s loyal soldier and her dead daughter’s husband has been hiding. Yeongyul stands, watching, staring at the mockingful act the brains have done, and how they are sustaining their mockery, he gazes at two of his children, being drunk from their skulls, and with every drop of wine that drifts from the side of the unfortunate Terrapus skull, tears drift from the eyes of the unfortunate Yeongyul. “You’re welcome for saving your life.” Says the man, apparently a red-haired man with a red beard and a long nose, dressed in barbarian wear and keeping two blades in his pocket. “Like Brainstorm?” Asks Mr. Greenwood. “I am fully entitled that I must protect the savior,” Says Rogue, still chewing. A huge, golden room filled with some of the fanciest brains and guests, fancy diamond and onyx chandeliers decorating the roofs, tables filled with the rarest of meats and the fairest of treats, glimmering floors, shining carpets, what room might include all riches of the world, other than the room of the Brain emperor himself? It is Astronomus’s great castle, the greatest one still standing, and on one corner stands himself, the emperor, speaking with his loyal servant. “What is it, Balis?” Says the emperor. That moment, Mr. Greenwood, Rogue, and little Markus have embarked on their journey to continue on towards the kingdom of Peaceham, Rogue is eating meat from a leg he has been holding through the trip, Markus just asleep, as always, and Greenwood watching through the window, not sure what they may come across this time. The journey has taken longer than they expected, it has been a week, and they have stopped for almost the twentieth time, to take a break and buy something to eat. Mr. Greenwood leaves the cart to buy a bunch of bread loaves and some butter to keep them fed for the day, Rogue is sent by Greenwood to a farther shop to buy milk for the child, and they return to rest at an inn for the day, Mr. Greenwood wakes up the next day, looking for Rogue to leave but not finding him. He follows down the stairs and finds Rogue talking with a guy in a coat and shades and a hat. Rogue returns to Greenwood. “I got something for the road,” He says, giving Greenwood a musket. “Don’t worry, I asked around, it’s recommended for Peaceham citizens to carry a fire-arm or any weapon for self-defense.” Assures Rogue. “Well, I hope you don’t put me to danger.” Says Mr. Greenwood. As they were leaving, Rogue seems to look at some cloaked figure passing by, holding a long flame cannon, the cloak shows not much but the mouth which is seemingly covered in hard, red skin. The cloaked figure looks back at Rogue, and both of them raise their thumbs up to each other, as Greenwood, Rogue and Markus drive off to continue their journey, hearing an explosion from behind but not too many people care. Finally, Mr. Greenwood finds the final stop before the kingdom, another normal inn, probably cleaner and with better service than the rest, they go inside, charge for their rooms, and go to sleep immediately. Later the night, everyone in the inn is awakened by the sound of a fight in the bar.. most people rush out to look, finding that it was Rogue, jumping between the tables to dodge other tables being thrown at him by a strange being.. it seems to be a being of the Deep, but one that none have seen, it looks a lot like the Grym themselves, but definitely without the power they are capable of holding. As he is watching the fight, Mr. Greenwood sneaks up into his room to grab his musket, as he walks, he finds an open room with slaughtered patients, he walks in to save anyone he can.. quickly, he finds a small, but very powerful acidic bomb... “I got an idea!” He says to himself, and grabs the bomb, then runs to his room to grab the musket. He sneaks back outside, and watches Orgon holding Rogue roughly, seizing his throat and trying to choke him, his hand, in itself, would make his throat explode, if it weren’t for Rogue resisting and trying to push his hands away. His two weapons are on the floor, far away from him... Mr. Greenwood sneaks a little more until he is behind a table s few meters away from them... quickly, he says. Orgon looks back, seeing something smaller than himself only meters away from him. “You call, weakling? I am busy!” He says, as he throws Rogue away from his hand, making him hit the wall, presumably dead. “I would cook you for dinner, but I don’t eat orgonic food!” Says Greenwood, pressing the trigger... suddenly, and after a 3 second hesitance, the gun fires a bomb, running extremely fast, as Greenwood runs as well, jumping behind a table. BOOM, goes the bomb, melting the entire beast, turning into molten rock as a little diamond-like creature emerges from the liquid, it starts screaming random words in a funny baby voice as it exits the building. “A-Are you okay? !” Screams Greenwood, Rogue seems to not be breathing, Greenwood stands up and takes off his hat and holds it across his stomach, looking down..
All of a sudden, “Boo!” Jumps Rogue. Greenwood falls to the floor, as Rogue laughs. “Are you coocoo in the caboose, Rogue?” Shouts Greenwood. And so, they started the trip early due to the wrecking of the inn, Greenwood takes his little son and finally manages to reach, in several hours, the huge gates of the kingdom, Peaceham Kingdom lies ahead of them, with the only thing between it and them being gates! Only a bit and they were inside the kingdom, surrounded by nice and peaceful different people talking, not only that, but also lost souls and animals and all different creatures in this wide world... they go straight for the king, a nice man who offers them a place to stay forever, a small but good house, together, Greenwood, Markus, and Rogue live together in this humble place. Rogue works as a soldier in the kingdom, and due to his strength and skill, he was quickly promoted rank by rank, until he became lieutenant in only 5 years... Greenwood starts creating less junkish junk, until he became an inventor and started to create helpful machines, like more advanced pumps and defense systems. He even reached the point where he was able to create robots and powerful ones, too, like the ancestors before the first apocalypse, and soon became one of the most famous inventors and celebrities in the kingdom..
And Markus, Little Greenwood, grown up to a fine child, and as he became at the age of 13, his “uncle” Rogue had already been a general, and he helped Markus to be a good fighter, and Markus himself was found having very high interest In fighting, he grew, powerful and strong, and everyone of his friends respected him and adored him... and so, as he goes to one of the far forests from the kingdom, he meets a strange creature that he has not seen but in the museum as a fossil.. it had a long mouth and fur, it was a brown bear! The bear, however, stood on two feet and wore a cloak, it approached Markus calmly, Markus took his sword out and got ready to kill him melee, but..
“Do not, Markus, I am not but here to guide you...” Says the bear, it talked to Markus! Now, before I keep going, can anyone tell me if someone is actually keeping up with my story? With one swipe, he cuts the tentacle off. “A Terrapus Dragon!” Cries Markus. The dragon roars angrily and takes a deep breath, Markus takes advantage and runs towards the dragon, and just as the dragon shoots a ball of fire, Markus jumps, dodging the ball while getting on one of its tentacles... the ball hits the floor, making a huge blast and setting the entire area on fire. That is one strong fireball! Markus clings onto the edge of the tentacle, and as the dragon tries shaking him off, Markus uses this to toss himself up towards its back. He slips and falls, luckily grabbing one of the dragon’s spikes as he falls, the dragon continues to shake, and then stretches a tentacle towards its back to grab Markus. The first one misses, and Markus quickly lets go off the spike, falling and holding onto a lower spike nearer to its tail. The tentacle slaps into the beast’s own spikes, as he growls in pain. Quickly, Markus lets one hand go, as he holds his sword and cuts a big part of said tentacle. The dragon screams in pain, and starts flying. He goes upside down while soaring into the skies, making it harder for Markus to keep ahold.. he thrusts the sword as hard as he can into the dragon’s body as he climbs up towards his torso, which is no facing the sky. He runs quickly towards its head, jumping through the several tentacles that try to stop him on the way, and before the dragon could turn around again, Markus grabs his head and swings above it, raising his sword..
“For the good lord!” He shouts, as the sword goes down, penetrating the creature’s skull, making a rough sound like the sound of a pickaxe going through onyx. A stream of blood runs through the Terrapus Dragon’s head as he loses his breath, and starts falling.. his body heats up completely and makes it harder for Markus to cling onto it, along with the spinning of the dragon as he falls, all he could do now is running opposite the direction of spinning, to avoid falling and his feet burning... just as the dragon becomes meters away from the ground, Markus lets out a short sigh, and jumps onto a burning tree, and keeps jumping between the trees away from the dragon... as it hits the ground and makes a huge explosion, tossing Markus dozens of trees a way, he hits the floor near his town. “This is an adventure I’m willing to go on again!” He says. Markus walks back to his town, but before he enters, he smells smoke and remembers that there had been a fire! “THERE IS A FIRE! A HUGE FIRE IN THE WOODS!” He cried everywhere. Quickly, armed men with highest mark frost cannons run to extinguish the fires, the mayor of the town walks casually to Markus, with an unpleasant look. “It wasn’t me!” Says Markus. He spends the next few minutes explaining to the Mayor what happened, with the dragon and the magical lake, and the cloaked bear which stood on two limbs..
“Your men will see the dead dragon in the forest! If he exploded, they’ll definitely see pieces of him! And the lake!” Cries Markus. ~ At these words, I almost fainted.. the last I could see or hear was the soldiers taking me in, and there I lay in the prison cell, with around 48 hours to death... a few hours later, I was visited by my father and my uncle. “Maybe it would have helped if you told the truth, son!” Shouts dad to me. “I believe him.” He says. “That is Impossible, Rogue!” Says Mr. Greenwood. I couldn’t talk this entire time, I was still in shock and I was sad all this time, I could barely contain my tears, or my fear. We talked for a while, arguing until it came to a point where we were all now crying. At this point, he was interrupted by the guard, signaling for visiting time to be over. He loses control of himself, the guards try their best to try and take him away by reason, in the end, they take him away by force... as he continues to shout. As he is taken away, Rogue stays, being a high rank in the army and having the power to move around the prisons as he pleases, he holds me by the shoulder. This is the last I see of anyone today, I am quickly scurried off into my cell, I barely get two hours of rest before I am called for recreation. I leave my cell and into the big hall, I take a tray and go to observe the area, high white ceilings, white walls and grounds... not the clean white, though.. I take a seat in one of the dozens of long tables, to eat what seems to be crushed meat and vegetable... essence? I don’t know, everything is just like piles of wet food material. After a few spoons of food, something takes a seat next to me.. sorry, it’s a brain, I’m not used to calling a brain a “somebody” as all I’ve been taught about them is that they were my enemies and that they are bloodthirsty creatures that love to kill us humans. He’s pretty thin for a brain, and appears to be pretty tall, the liquid in his tank is.. some blueish green color, like it is dirty. “Can I eat next to you?” Asks the Brain, too nicely for me to turn down the offer. He notices the way I looked at his prisoner clothing, red, red clothing stands for death sentence, and a person can only murder for this sentence.. he can’t but laugh at my remark. “Yes, and you’re here for picking flowers!” He says, finally calming down. “Can you listen to me for once? !” I shout, dropping my spoon with food. He stops talking and gestures to me to continue. I finally get some sleep, some much-needed sleep... but to my “luck”, I heard a loud banging sound, I wake up, but it seems like nobody else heard it.. and suddenly a cloaked man appears in front of me, he is cloaked in black and the cloak is covering his entire body. He looks human enough to tell he is a human, but he has a slim body and I can see a part of his face, seems handsome enough to be royal blood, or.. perhaps he’s had some of a royal life? The bear in a cloak teleports with him, he appears now next to him. “You!” I shout angrily, running at him to punch him for all my troubles.. but then being stopped and taken to mid-air as the cloaked man raises his hand forwards in an act of instance. He holds my hand, and in an instance, I feel my entire body perish from the thread of existence.. as if I were riding the threads of time into a.... different world. Special Mention: You’ll find out, soon. Hm... egh... err... uhm... eck.... oof.. Thank you! Our (my) job is keeping you guys entertained for as long as possible! ~ Meanwhile, in a world completely different from ours, almost miles below everyone else... black everywhere around you, Death is at every maw, every mushroom holds the will to make your children orphans... this domain, as horrible as it is, is no place but... the deep biome, the underground domain, the spawnpoint of the forces of dark... one person would think nothing lives in these parts, humanity has not yet gathered the will to return and explore this domain as they did in the past, and even those who do faced their worst fates. The dangers in the world increased, the lonely fact that it is the home of the Grym, the dark creatures of time, keeps any adventurer, no matter how brave, from coming close. “Ah!” Says a tall, buff being.. looks like a man, but he is made of gray rock and has huge shoulder protectors, or could they be intimidating decorations? The creature is twice the size of human, leaning on the fence of a very high tower in this toxic wasteland. “Isn’t it beautiful, Redus?” Asks the being, while still staring at the abominations below himself, this time before another being comes closer. He looks like a very strange mutation of sorts, he possessed the head of a Cthulhu, and four arms from different creatures including androids, terrapi, revenants, and brains, and legs that look like Tyrannosaurus rex legs. He has a body as wide and buff as that of the gray man, but only bigger and more muscular... except something feels more powerful within the gray man. “Beautiful? We are abominations! Monsters!” Replies Redus, angry. “They don’t have what we have!” Shouts Darmeus, proudly. Redus only sighs, but continues to listen to the man. “The power within our men is otherworldly, extraordinary, not but legendary! I think I got a plan.” Continues Darmeus. “We have one on our side.” Says a completely different voice from behind, a young voice to say, both Redus and Darmeus turn to look at the source of the voice, it seems to be a very evolved revenant, an Epic Revenant, and fully armed with onyx armory, with advanced weapons in his pocket but a long double-edged dark spear. Both Darmeus and Maverick laugh, Redus is still silent for some reason. “He’s a god!” Replies Maverick. The two look at each other and then keep silent. They both start laughing uncontrollably after a long stare, and continue for a minute or two. “You are confused, and wondering why I rescued you from your unfortunate sentence..” Says the man. “Obviously, but I’m more curious why you got me into it in the first place.” I say while looking at the bear at the last part. “I’ll tell you later,” He says. “You’ll know later.” He says. “I demand answers!” I shout. The bear frowns, and looks disappointed as the man walks towards me. “Don’t feel down,” Says the cloaked man, putting his hand on my shoulder. Many questions swim around my head, but I decided to let them be for now since I’ll most likely be told that I’ll “know later.” I decide to go with the two. We continue to walk into the cave, I try touching one of the glowing crystals, but Alpha slaps my hand as I continue to walk, we finally reach the end of the cave after ten minutes. It goes into a big, beautiful forest, the trees, animals, even the butterflies are something I’ve never seen before. “Wha..” I ask, being interrupted by Alpha. “OK guys, since you didn’t tell me what to do and you seem to be in control here..” I say, I try taking my sword out, but instead of my old sword, I am now carrying a mechanical sword! I’ve only read about these in the old books, and I think I know how to use them if they really are like the legends..
And without further ado, they disappear again and I start looking around me, a horde of brains surrounds me, led by a dire large brain, which makes sounds, ordering them to prepare for attack! Sigh, something tells me it’s going to be a long day..
“What do you bring, Brus? Games?” Calls the emperor. “Your majesty, it is a message.” Replies the minister. “From who?” Says the emperor, looking rather surprised. “It is yours, your majesty... I think you would want to see this..” Says Brus. “Read it to me.” Says the emperor. At this part, the emperor becomes angry. The minister moves closer to the emperor to show him the text. As he continues, he scrolls to show a few pictures, some of more advanced muterrapus, some of mechanical forces, and one particular image that caught the emperor’s attention.. a gray being, the picture was only seen in a hand-drawn form in the books before, the grym..
“The...” continues the emperor, but stopping for a while to think as Brus continues the message. “‘We attack very soon, I’m telling you this because I know you will stand without any ability to stop our force nonetheless, you better run, because you won’t be able to, very soon..
“No..” continues the emperor once more, with apparent nervousness and worry on his eyes, as he keeps floating up and down the hall, then returning to his minister. “Sir Brus.” He says as a look of anger dawns upon his face. “NQ19 your majesty?” Asks the minister in shock. The minister runs out of the room, shouting can still be heard from Brus calling for the servants to gather the ministers and leaders of the empire. At this very moment, in a huge factory underground, within a close enough approach to the deep biome while still being in the overworld, human workers are working and operating mechanical devices and gadgets, some are throwing objects in a huge pool of acid below the factory. All the workers wear a distinguishable big cat helmet and are dressed in appropriate armor and clothing for their working condition. “There there, this is not how you treat an official..” Says Maverick, with his hands behind his back. “Back off, this is unauthorized property and your kind is not allowed here.” Says an apparent general who just now exits the factory with two mark four energy cannons in his hands. “That’s funny, I was going to say exactly the same thing!” Continues Maverick. “I am Prince Maverick of the Deep Kingdom. Your building is too big to ignore and is within our borders, and you are directly taking our energy, acid, resources, and space.” Says Maverick, casually. The men laugh, followed by the general. Once again, the men point their guns at the revenant, followed by the general. “Sigh... we gotta do it the hard way then.” Says Maverick. Quickly, the entire group of men shoot with their cannons, the energy and steam puffing out of the weapons makes it harder to see, and after half a minute of shooting, they stop to collect he ectoplasm he has dropped, but surprised, they find a wooden log in his place. With quick succession, Maverick flies atop their heads with a forged blade and takes off a bunch of heads, and keeps turning around to evade the hundreds of energy shots that are shot towards him. Maverick takes a few hits, but his armor defends him quite a bit although he still pains a little, quickly he turns his hands around and summons a dark twister, which moves around sucking in most of the men, most of them meet their doom, the other unintelligent men who have been firing energy have only been making the twister more dangerous. Noticing this, the general quickly orders the remaining men to fall back and escape. He manages to get away with a dozen men..
Instantly, the twister deforms, corpses emerge from it dead, one by one, until a living one, although barely breathing and beaten up almost enough to blind him, flies out, landing in Maverick’s hands. “Where is he.” Says the Maverick, casually as usual but with visible anger. “Where.. is... what.. sir?” Mutters the man. “You know what I’m talking about,” Continues Maverick. “Kill me if you want.” Says the man. The man swallows, and goes silent once more. “Fine, you can go to hell later.” Says Maverick, as he sticks his hand so hard inside his chest, it penetrates him. He pulls out a bunch of stuff, liver and pancreas, and warps him somewhere. Suddenly, the first brain jumps at me to grab me, quickly followed by dozens more... with my blade still puffing steam, I jump back, just crossing beside it while my blade cuts through the tank as I fall on the other side... I run back towards the brains and start beheading a good few, well, bebraining if I want to make things literal, heh. The heat coursing through their acids would sometimes cause them to explode after dying, which has until now left me a few injuries and bruises so I am careful with my attacks either not being fast enough as to igniting the acid, or slow enough as to help me escape before it blows my face up. The brains start increasing as I slash them to the ground, and they start to surround me even more. “A lake!” I say as I spot a lake of fresh water, I start swimming through as I look behind me. The brains I knew hated water, but these seemed to just... swim through! Even faster than I am swimming! I decide to dive into the water, I swim past the tropical fish and little pieces of red plant... the Lake seems to be bottomless.. wait a minute.. this is definitely not a lake.. it’s an ocean! I’ve never seen one as far as I remember, but I can tell how it looks like from the description and the lessons I’ve learnt in my class. The brains are still diving behind me, until I get far through, I am running out of breath and decide to face them, as they get close, they get a jet of shock and run away from me as fast as possible. Almost instantly I notice the water getting much darker, then I feel the approach of a very heavy breathing. I turn around and notice a huge octopus behind my back, or a squid maybe? It seems to be part mechanic, but aside from that, it goes up to at least two miles tall and a mile wide. It stares at me with an eye a dozen times larger than myself, and another half-dozen eyes stare at me from farther away. The octosquid (or so I call it.) starts to chase me, but within a second of its beginning it swings its tentacle at me, I dodge the tentacle but the water it generates pushes me through the water like a missile! Quickly, I am tossed back at the surface, as I watch the octosquid ascend from the ocean. I continue to run away, but I didn’t make it too far before a tentacle grabbed me and the octopus started to address me without moving it’s mouth. “Gulp, this doesn’t seem too good..” I think to myself, being frozen with fear against the huge being that holds me within its grip. I just stood there, thinking about what I can do at this point, so I just decided that maybe I could talk my way out. “My name is Markus Greenwood, and I mean no harm!” I shout at once. I feel the mechanical monster’s grip being loosened slowly from around me, as he looks at me from up to down. “THE Markus Greenwood! OMG!” Shouts the octosquid, I feel the urge to giggle, but try to prevent myself from showing any expression. As I watch the being, suddenly its head opens up and a man is seen seated in the middle around a bunch of control panels, waving at me, in the exact middle of the head, wait, it’s not a man, it’s a teenager, probably 5’a bit aged 17 or such, brown hair and dark-ish skin, and a more childish expression than that of a person who should be in his current position, in charge of such a huge protection mech. “Do I.. know you?” I ask, confused. “Particularly, I’ve fought one terrapus dragon, and have defeated it so..” I continue. “So you’re the reason why I have been given a death sentence!” I shout, angrily, trying to slash around me with my sword. “Yeah, wouldn’t want you throwing up and ruining the new suit!” He says, then one tentacle opens into a hole, and I am sucked into it. I find myself inside the control room, with the guy, he spins around with his chair to face me, as he sets his machine to dive towards the kingdom on its own. “Aren’t you a little too young to control a robot?” I ask. “Then... can I at least know where we are off to?” I ask, confused. “Kingsley’s, somebody’s waiting for you!” He says, laughing, as I stand still confused, and look out the window to see the huge peninsula in the distance. ~ Our story returns to the world we knew, which, by the way, is known as the Continent of Salvaria. A black market in the middle of an unsupervised part of the outskirts of the Brain Empire, where all beings lurk, humans and brains, androids and Terrapi, all of them share the look of a thug, or a member of some poor mafia, or sometimes a beggar. The area is known as Roguia, it is named by a rogue “businessman” which has built this market to make profit and hide from both the Brain government and the big cats. He was not a very lawful man, dealt with nuclear weapons, particularly mass-extinction machines, before they were banished by a contract between the humans and the brains after World War III ended in 294 AA. He, however, still searches for the opportunity to strike a nuclear deal, although he doesn’t find any of those at these times. “What do you mean you got nothing! ?” Asks the cloaked man. “Nothing, mercenary. Get lost!” Shouts back one of the men, a black android, who is part-human, who the cloaked man has been talking to now to buy the weapon. “Jokes on you, my blood is black.” He says, smirking as he teleports behind the cloaked man and grabs his throat, revealing his face to be that of an elite and much-evolved Terrapus, it is Yeongyul, the Terrapus that has survived the massacre of the Terrapus kingdom, son-in-law of the deceased queen. He is struggling to take his breath, but quickly, he manages to break free by kicking the Android in his leg, causing him to trip partly, as Yeongyul takes a step backwards and takes his two blades, made mostly of iron and coated partly with onyx, out of his belt. The Android acts back by emitting a huge blade from his right arm. “You better apologize and kiss my feet,” Shouts the Android, as the surrounding people start stopping to check the fight out. “Since when does anyone kiss the slave’s feet?” Replies Yeongyul. At this point, things have gone crazy, the people were talking to each other in a high voice and the android was losing it. The only thing worse than provoking a grym in his home is calling an Android a slave, this was when the android dashed at diabolical speed to behead the Terrapus, but he wasn’t fast enough, as merely a millisecond before that, two blades were raised to meet the blade on the way. “Slave? Yeah? at least I’m not food!” Says the Android, officially starting a flame war. Yeongyul quickly spins around to slash while he leaves one blade to hold on to the big blade, but he was parried by the same blade, in a move that looks too fast to be a parry movement, and more likely to be an instant phase change. “Stop manipulating time!” Shouts Yeongyul, pressing in with his blade as his second blade rejoins, still making no progress whatsoever in reaching the Android. “If that’s another way to say “I give up”, I’d rather hear it from you directly..” laughs the Android, as he spins, once again at that speed, as Yeongyul once again parries it, this time it was apparent that the parry was incomplete, as Yeongyul was having a hard time maintaining his defensive position. This is when the battle broke through, Yeongyul started to slash multiple times at once, trying to catch the android in an act of surprise. Unfortunately for him, the Android also continues to slash, although his weapon wasn’t as strong as the blades Yeongyul possess, and him having one weapon against two which was supposed to give him a disadvantage, he still managed to swipe with his blade around seventy times a second, catching Yeongyul in an act of speed and causing him to fall to the floor as he wounds his leg. Yeongyul manages to keep the pain in, but he glares at the Android, angrily. Various people are shouting “Kill him! Kill him! Kill him!”, it’s not really a thing they have against Yeongyul, but their rogue manners make them more than happy to see a fight end in a bloodbath. Before the Android could gladly grant the spectators their wish, the people suddenly all kneel at once, and as the Android notices what they’ve been looking it, he joins. Yeongyul, however, struggles to stand up to obey the law of the lawless. The owner doesn’t have any weapons, but as legends go, he looks like he could deal a lot without any. He looks at Yeongyul, then at the Android. “Now, I won’t let you two kill each other, especially when I need you!” Bluebeard says. “Me?” Both Yeongyul and the Android say at the same time. “Yeah, kind of trying to earn some money here selling my weapons and..” adds the Android, but both were interrupted by a huge bag filled with gold thrown into the chests of each of them, and as they both observe the gold inside their bags..
“.. but I guess I can do a job to pass time!” They both shout in excitement. ... Later that night, Maverick moves through the factory, slaughtering the resisting workers. He approaches a pool of acid, with a cage controlled by one worker. “You won’t get the grym! I’m the only one that can pull him out, and I’d rather die than let the world end on my, or anyone’s, behalf!” Shouts the worker. “Fragile peasant,” sighs Maverick, as if he was about to say something else, but he quickly shoots a powerful ball of flame, disintegrating the man in an instant without leaving him a chance to react. “I love what I do!” Says Maverick, laughing maniacally, as he points with both his hands towards the pool of acid, and starts mentally raising the cage until it becomes in front of him, and he leaves it down, watching as the Grym, the huge gray and powerful being of legends, bends the steel bars without touching them, and going outside. “It is not as simple as that, Maverick.” Says the Grym, expressionlessly. “You know my name? Fascinating.” Says Maverick in a lower voice, as if to himself partly. “Hah! Even better! Come on, old man.. Darmeus told me a lot of tricks, and I’m ready!” Says Maverick, slowly rising to the air. “Darmeus is not my lord, and I am not Darmeus.” Continues Maverick, this time his eyes start to glow red. “I will torture you to death.” Says Maverick in a much deeper voice. “What do YOU know about torture, mortal!” Screams the Grym suddenly, as he quickly becomes in front of Maverick and hits him across the face, tossing him across the factory to break the walls, he gets up easily and starts charging red-powered whips from his hands, he starts glowing red even more. “More than you will see from me, arrogant mortal!” He finally shouts, breaking out and looking like a being made completely of red energy, he starts firing bolts of red energy at the speed of sound, but the Grym dodges them all as if they are nothing, and quickly appears in front of Maverick again, this time he squashes him with both hands. This time, however, Maverick manages to slip out fast enough and hits the Grym across the face with his whip, twice. “You have officially passed the line, revenant!” Shouts Grym, suddenly breaking out, as the world around them becomes completely black and white. Maverick seems to be seeing multiple instances of the Grym moving around, each taking a turn at dashing and punching him. Maverick quickly escapes the circle and stands into a corner, as a group of three men bust into the factory in a car vehicle. They are Bluebeard, Yeongyul, and Gucym. “I think we came at the wrong time..” Says Gucym. Maverick looks at the group, and so does the Grym. “Technically, you can.” Say both Maverick and Bluebeard in the same time. “You got a deal...” Says Bluebeard. It’s a huge kingdom, everything is mechanical, there’s fast vehicles, ground and flying, robots flying everywhere, moving objects and helping humans in building and other things, it was a truly amazing sight, seeing everything and everyone helping each other to keep the city up... and in the middle of the city, a huge castle, being surrounded by the flying robots. “What kind of steam makes this?” I ask, not really knowing how I can describe.. this! “Don’t pressure yourself, you guys will discover that soon or later.” He says, taking my hand and walking through the city, greeting almost everyone he sees, until we’re at the door of the castle.. I am taken inside, and walk for quite a bit until we’re already on the top floor. “Sit on the couch while I talk to the king.” Says Nick, walking into the next door. I quickly return to the door and lay my ears. I can hear them talking, but for some reason, I can barely tell whose voice is whose. Now was some silence, perhaps he nodded or gave a thumbs up or something. As I hear this, I quickly sneak back to my place and sit, as a second later, the door opens. “There’s cameras here, yeah, and don’t ask what those are, we thought we’d let you listen instead of having to tell you everything again, I hate repetition!” Says Nick, being the first to come out, followed by a man with a huge brown beard, and a crown, which must be the king. I kneel to him. “Rise.” He says, and so I do. I stand watching, until out of the same door, comes Alpha, in a fairer coat and clothing. “Alpha! It was your plan all along?” I say. “Markus! Charmed to see you again, how did you do?” Replies Alpha. “When am I going back to Peaceham?” I ask. “Your majesty, I thank you for your generosity.” I say, kneeling once more, while thinking of what is to come. ~Everyone is looking at each other now, the Grym, Yeongyul, Gucym, Bluebeard, and Maverick, for a moment of thought, until Bluebeard takes out a huge axe and throws it as powerful as he could towards the Grym. The Grym catches it with his hands, and throws it back to another Grym, which carries it and throws it at the sky.. What is happening is... indescribable, the axe is duplicating, and so are the Grym, and they are waving around, until the axes collect into one axe, which was thrown by the Grym towards Bluebeard. Bluebeard jumps out of the way, but the collision of the Grym-empowered axe with the wall still manages to toss Bluebeard away. As he gets on his feet quickly, Grym had already gotten ahold of Gucym, as he takes his huge blade out to slash the Grym’s arm, with which he responds to by throwing him upwards, and smacking him so hard, he practically penetrates the Wall. In an act of surprise, and even shockingly for the Grym, the Grym is met by a very powerful fist from Bluebeard, which drops him to the ground as the energy takes ahold of his body, preventing him from moving and causing him a lot of pain. Quickly, Yeongyul returns to his position, and reconnects his blades, while spinning roughly with them, wounding every part of the Grym’s body. “IDIOTS!” Shouts the Grym, creating hundreds of multiple copies of himself, and sending all the people surrounding him away, except for Maverick. “Oldest trick in the (REDACTED)ing book!” Shouts Maverick, as he dashes once more at the tired Grym, creating a spear made of pure energy, and impaling the Grym’s chest, causing the copies to fade, and even the illusion, where the place finally returns to normal, except the factory no longer has one piece bigger than one cubic meter in size. On the floor, lays the Grym, bleeding with blood that is an extremely dark shade of red. Still alive, but struggling to even keep his vision straight. Truly, a Grym is the strongest predator, but when losing blood, it can become the weakest prey. Bluebeard, Yeongyul, and Gucym walk away, as Maverick looks at the dead Grym in satisfaction, yet confusion and shock.. you don’t see a dead Grym every day, do you?